Good, free educational technology is a great thing. Create a private Facebook-like community for your specific class. It’s free to sign up and easy to use especially if you have used Facebook before. 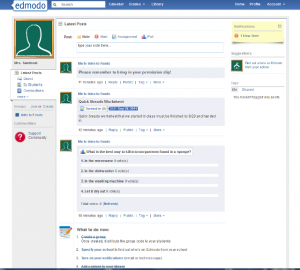 The only drawback I can see with a program like Edmodo is your school’s policy on using their online platform. I would be less likely to use Edmodo if I was required to post stuff to a place like Edline already. Posting things twice is double the work and we’ll we all don’t have that much time. Keeping kids engaged in yet one more program that is vying for their attentions also means you must be committed to using it or students will not check it.